× eight = forty Required Please enter the correct value. The Dow Jones futures are on the rise this morning as investors await a report by the U.S. Federal Reserve and markets weigh the worthiness of President Donald Trump's Supreme Court nominee. Markets are reacting to yesterday's earnings report by Apple Inc. (Nasdaq: AAPL), which easily topped Wall Street expectations. But don't discount the impact of today's meeting by members of the Fed Open Market Committee. 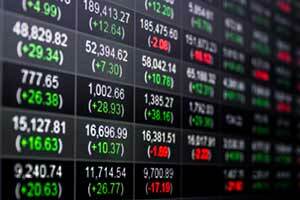 On Tuesday, the Dow retreated another 107 points and the CBOE Volatility Index roared close to 4% thanks to underwhelming earnings reports and lackluster economic data. A week after crossing the 20,000 barrier, sentiment is turning negative. Here's a look at today's most important market events and stocks, plus a look at Wednesday's economic calendar. The Dow Jones Industrial Average projected a 51-point gain as investors react to Apple's strong earnings and revenue and markets prepare for another busy day of data and quarterly reports. In labor news, the United States saw private payrolls increase by 246,000 in January, according to a report from ADP and Moody's Analytics. That figure easily topped the 145,000 new jobs expected by economists and a sign in confidence by employers. The Federal Reserve is in focus as the central bank concludes its first two-day meeting on monetary policy of 2017. According to CME FedWatch, the markets have set a 96% probability that the Fed will leave its benchmark interest rate unchanged. That said, markets will be quite interested in hearing the reactions of the U.S. central banks to the economic policies of President Donald Trump and if their expectations for three rate hikes in 2017 are still swirling. Crude oil prices were rising overnight despite news that U.S. supplies continue to offset the impact of OPEC's deal to cap excessive oil production. This morning, traders will be looking out for an official supply report from the Energy Information Administration. The update comes after the American Petroleum Institute (API) announced that U.S. inventories increased last week by roughly 5.8 million barrels. According to API, U.S. crude inventory levels are now at 488 million barrels. The WTI crude oil price today added 0.6%. Brent crude gained 0.7%. Gold prices hit a two-week high ahead of today's announcement on interest rates by the Federal Reserve. Gold prices pushed higher Tuesday after President Trump demanded that U.S. pharmaceutical companies produce products in the United States. A senior adviser for President Trump also issued a statement on the valuation of other nations' currencies. Peter Navarro, the head of Trump's National Trade Council, said that Germany is using a "grossly undervalued" euro to gain competitive advantage against other exporting nations. Money Morning Resource Specialist Peter Krauth just recommended that investors own more gold in 2017. That's because he projects an 18% gain for the yellow metal in the year ahead. But the big story is President Trump's Supreme Court nominee. Read everything you need to know about Neil Gorsuch, Supreme Court nominee. He's a Colorado judge who has been nominated by President Trump to replace the late Judge Antonin Scalia on the nation's highest court. But a battle is brewing in the Senate. And The New York Times has already dubbed him a nominee for a stolen seat. Learn all about Neil Gorsuch and what his placement would mean for the United States, right here. In earnings news, shares of Apple Inc. (Nasdaq: AAPL) jumped more than 3% after the company easily beat first-quarter earnings expectations. Meanwhile, shares of Best Buy Co. Inc. (NYSE: BBY) are in focus this morning. The big-box retailer reported earnings and revenue largely in line with Wall Street expectations. The firm reported EPS of $1.69 on top of $13.589 billion in revenue. The consensus expectation among analysts was EPS of $1.66 on top of $13.565 billion in revenue. Meanwhile, shares of Facebook Inc. (Nasdaq: FB) gained another 1% in pre-market hours as the company prepares to report fourth-quarter earning after the bell Wednesday. For the Q4 2016 Facebook earnings report, the company is expected to report EPS of $1.31 on $8.5 billion in revenue. The company is also expected to report a total of 1.83 billion MAUs and 1.19 billion DAUs. Here's our complete preview of the Facebook Q4 2016 earnings report. Keep an eye out for additional earnings reports from NXP Semiconductors NV (Nasdaq: NXPI), Cirrus Logic Inc. (Nasdaq: CRUS), Symantec Corp. (Nasdaq: SYMC), Edwards Lifesciences Corp. (NYSE: EW), Baxter International Inc. (NYSE: BAX), Johnson Controls International Plc. (NYSE: JCI), and Automatic Data Processing (Nasdaq: ADP). MBA Mortgage Applications at 7 a.m.
ADP Employment Report at 8:15 a.m.
Gallup U.S. Job Creation Index at 8:30 a.m. Three-Year Note Announcement at 8:30 a.m.
10-Year Note Announcement at 8:30 a.m.
30-Year Bond Announcement at 8:30 a.m.
Treasury Refunding Announcement at 8:30 a.m.
PMI Manufacturing Index at 9:45 a.m.
ISM Manufacturing Index at 10 a.m.
Construction Spending at 10 a.m.
EIA Petroleum Status Report at 10:30 a.m.
FOMC Meeting Announcement at 2 p.m.